A fire extinguisher is one of those items that you don’t realize you need until it’s too late. Given how unpredictable yet potentially lethal home fires can be, it is the duty of any responsible homeowner to invest in at least one fire extinguisher to safeguard their household. 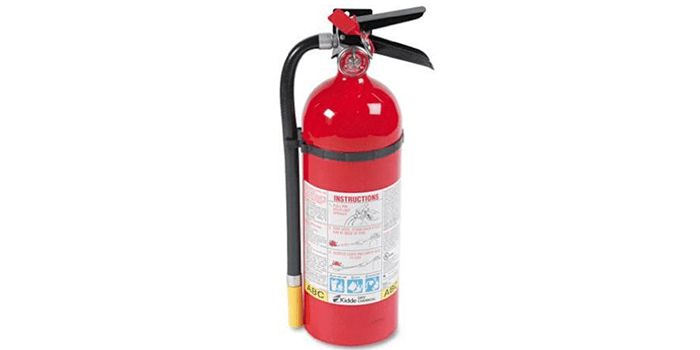 As a bare minimum, you should at least consider a multipurpose, full-floor fire extinguisher for every level of your home along with a smaller one for your garage if need be. With that in mind, let us find out what are the ten best home fire extinguishers the market has to offer at this point in time. Known for its performance levels and premium grade build quality, the ABC Dry Chemical Fire Extinguisher is a high-end product by most standards. Equipped with a commercial grade valve and trigger made from high-quality metal, it comes with a pull pin that is easy to use, along with a safety seal to prevent any accidental discharge. Featuring a uniquely designed pressure gauge that notifies the user of the status of its charge, it comes equipped with a bracket along with a durable strap that allows quick and easy storage and mounting. 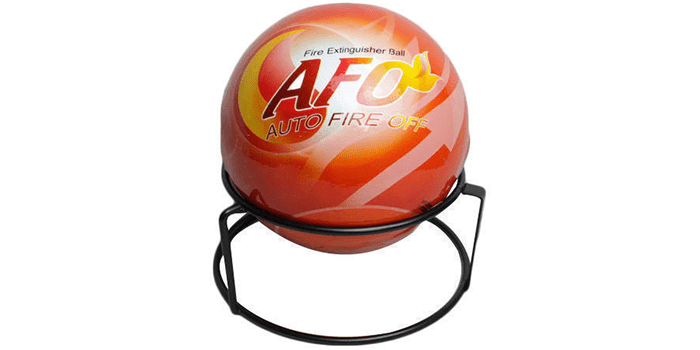 Weighing less than 3 lbs, the AFO Fire Ball Fire Extinguisher is a handheld device that is reasonably maneuverable and easy to operate. Safe to use, it fights Class A, B and C fires that include combustibles, flammable liquids, and electrical equipment. Thanks to its unique design and technology, this extinguisher self-activates when rolled or thrown into a fire, going off within 3 to 5 seconds and completely extinguishing the fire. Made with premium quality materials, this fireball is safe to use, eco-friendly and non-toxic. Featuring a bright red and white vinyl sign, this ball can be seen anywhere if an emergency occurs. 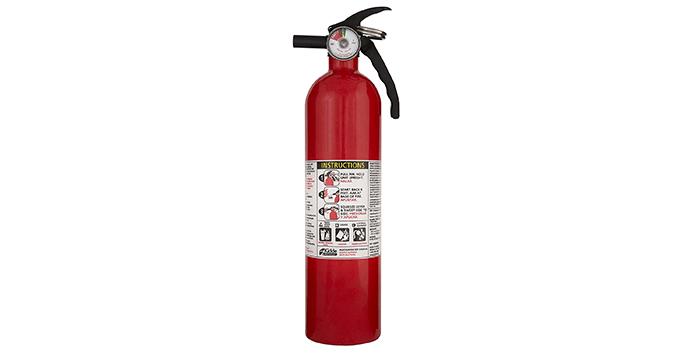 Ideally utilized as a safety measure on common fire hazards, the Kidde 466204 Pro 10 Fire Extinguisher fights Class A, B, and C fires and is UL rated 4-A:60-B:C. Thanks to its uniquely designed pressure gauge, it allows the user to check on its charge status and when it is ready for use. Made from high-quality stainless steel that is resistant to impacts, it comes with a clear label with step by step instructions on how to operate the device and an easy to pull safety pin. With a discharge time of up to 21 seconds and a range of 20 feet, it features an operating pressure of 195 PSI. Thanks to its valve, handle and a lever made from durable stainless steel, it comes with a powder-coated cylinder for optimum protection against corrosion. 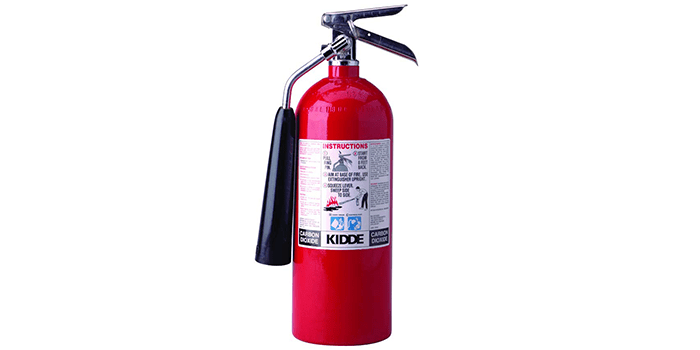 Made from premium grade aluminum, the Kidde 466112 Fire Extinguisher fights class A, B and C fires. 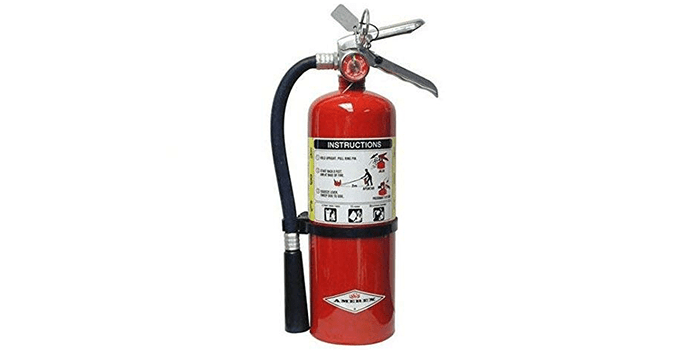 Ideal for utilization on common fires around the household this extinguisher is UL rated 3-A:40-B:C. Easy to operate and light in weight, it comes with a special gauge that tells you when it’s fully charged and ready for use. Designed and constructed with anti-corrosion aluminum, its cylinder is light in weight and extremely durable. Equipped with a discharge time of 13 to 15 seconds within a range of up to 18 feet, it features a 195 PSI operating pressure. 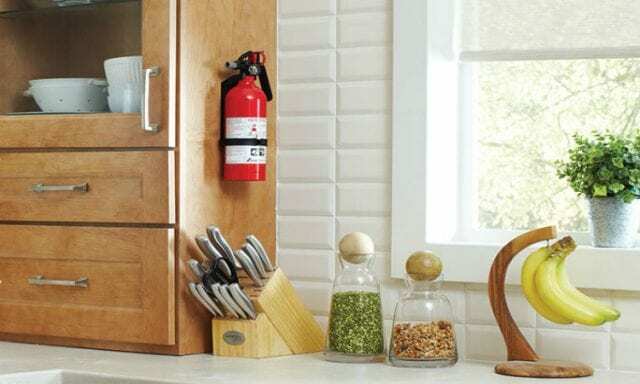 The Kidde 466180 Pro 5 Fire Extinguisher is a premium quality extinguisher that is designed to fight Class B and C fires only and is UL Rated 5-B:C. Safe on food and electronics, this product will not contaminate the environment and is safe for you and your family. Crafted with a heavy-duty metal nickel-chrome plated brass valve that is resistant to outer impacts, it comes with a durable stainless steel handle and lever that makes it easy to operate. With a quick and convenient safety pin that is easy to pull, it comes with a clear cut label with a list of instructions on how to use the device. Suitable for electric equipment and liquids, this fire extinguisher works at an 850 psi and won’t damage valuable items. The Amerex B500 Fire Extinguisher is a Class A:B:C dry chemical extinguisher that is specially crafted to use on combustible elements, flammable liquids and other fires including live electrical equipment and objects. With a 14 second discharge time, this durable, high-quality extinguisher helps put out most common fires that occur around the household. Designed and constructed with an all-metal aluminum valve, it comes with a wall bracket that allows easy storage and is space efficient. 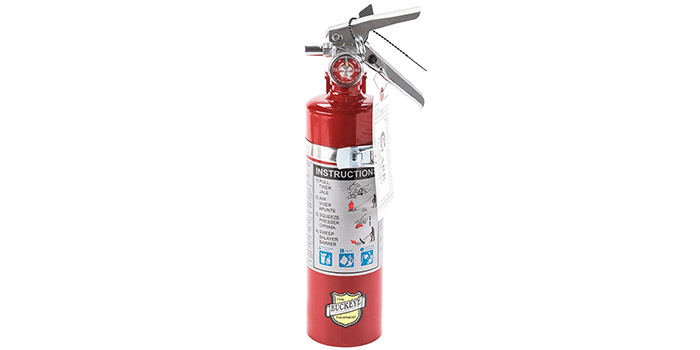 Featuring a heavy duty all metal design and construction, the First Alert Rechargeable Fire Extinguisher comes equipped with a commercial grade valve and trigger made of metal. 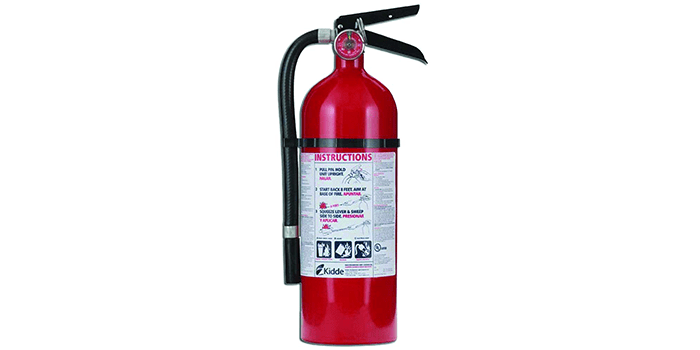 UL rated 1-A: 10-B:C, this fire extinguisher puts out wood, plastic, oil, paper, gasoline and electrical fires with ease. Easy to read and operate, it is resistant to corrosion, designed with a color-coded gauge and comes with a label with instructions that is waterproof. Using mono-ammonium phosphate as its extinguishing element, this cylinder can only be recharged by professionals and experts after use. The First Alert AF400-2 Fire Extinguisher is a heavy duty extinguishing agent that comes with a 32-second discharge and firefighting time which is 4 times longer than any other fire extinguisher. Ideal for kitchens, garages, RV’s, dormitories and boats, this extinguisher features a lightweight aerosol can that is easy to carry and convenient to hold. With the ability to put up paper, wood, electrical, grease and fabric fires, it features a high-quality formula that is biodegradable and does not contain any harmful toxins. Providing protection against Class A, B, and C fires, the Kidde Pro 210 Fire Extinguisher is a powerful product that can put out fires caused by trash, paper, wood liquids, as well as electrical objects. 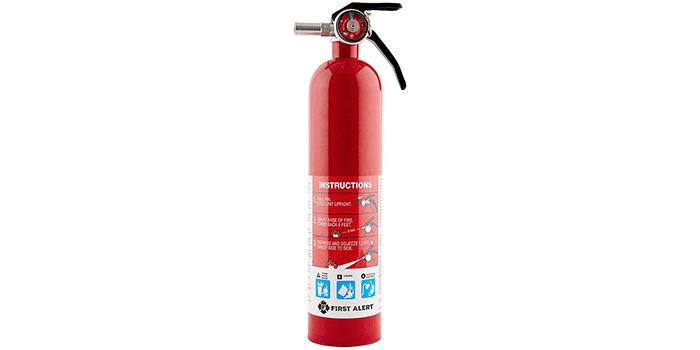 Easy to operate, the extinguisher comes with a gauge that notifies the user when the cylinder is full and ready to use as well as a list of step by step instructions on how to operate the extinguisher. Made with lightweight, durable material, it is constructed with high-quality aluminum that is resistant to corrosion. With a discharge time of approximately 15 seconds within a range of 10 to 15 feet, it features a 100 PSI operating pressure. Easy to operate, durable and light in weight, the Kidde FA110 Fire Extinguisher offers multipurpose protection against class A, B and C fires. 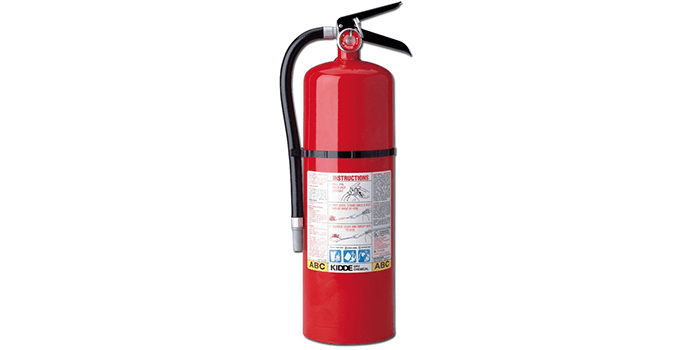 Ideal for common fires, this extinguisher is UL rated 1-A:10-B:C, making it one of the best in this price range. Equipped with a heavy duty gauge that informs the user the status of its charge and when it is ready to use, it features a safety pin that is easy to pull out when needed to be used. Boasting an all-metal construction, the extinguisher comes with a commercial grade valve and trigger made from high-quality metal for good measure. Approved by the US Coast Guard, this product includes an instruction label that lists the steps on how to best operate the device.